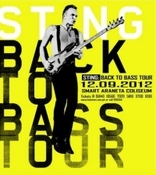 It was a night of epiphanies at Sting's Back to Bass show at the Smart Araneta Coliseum last Sunday night. That was completely unexpected as, armored in hipster cool, I was just there to do a job and nothing more. Having a nice time? Not even on the radar. It's just not the scene for the likes of me, I sneered quietly to myself, lest someone overhear and give me a deserved thrashing. And so I started what I assumed to be the first of an army of eye rolls of the evening. Getting themselves organized in the lobby of the Araneta Coliseum, the crowd was much older than what I normally see in these kinds of events. Most were gray-haired, out of shape, middle-aged nanays and tatays, out for a night to relive their long gone days of youth in their chinos and heels. Enter epiphany number one: I was a gray-haired, out of shape, middle-aged tatay. My lacquered (greasy?) veneer of cool was so thick that it locked up the truth of my receding hairline into the dark recesses of the mind along with the other monsters. And what worse monstrosity is there than an old man playing daddy cool? Senility has set in as well as I'd forgotten to tell the bosses that I had a fear of heights. They got me a spot on a bench up in the nose-bleed section which was a hard reminder of my phobia. I tried my best to avoid taking a glance at the long-way-down as well as the I'm-so-close-to-the-ceiling vista. I tried to fight down my fear by retreating into my thoughts. I'm normally up for anything, musically speaking. I like all these genres, or at least I'm willing to listen to it at least once. But the affability stops short of Sting for two reasons. First, the girls just love him and back in my school days, there was just no way I could make any impression with the girls if the competition was this scowling blond guy on the album cover. So lonely! I didn't let on that I was wounded, but inside I was crying. And at some point I agreed that it did get a little pretentious. I snapped out of my reverie as Sting and his five bandmates walked out on stage, the man himself all in black, shirt tight across his pecs, skinny jeans and boots. The coliseum is deafening as the object of their love is handed his bass and they start things off with 'If I Ever Lose My Faith In You'. Its a mid-tempo piece rather than a high-energy number one expects at the start of a concert, but the crowd was all keyed up and didn't need a kick start. Furthermore, it's a sweet little song that was in tune with what everyone was feeling that night. This is when epiphany number two occurs. It turns out that I know it all: every line of it, every pause, every rise in pitch, the change-up in the bridge. I sang along with the entire audience in that moment of community karaoke worship. Even I was unaware that after I denied him half a life ago, I was still listening, paying attention. When he moves on to 'Every Little Thing She Does Is Magic', it is even more familiar ground and people were on their feet rushing the guardrail in front of the stage. It wasn't exactly a bum rush, though. It seemed a polite affair, with people making sure they don't press up against each other. There's one person jumping up and down. And there are about three hand fans, waving back and forth, cooling some Sting fans. The true nature of the matter revealed itself when Sting and his merry men moved on to 'Englishman In New York'. They started in on the song's instrumental introduction, and the audience just jumped right in with the chorus. On and on it went, "I'm an alien, I'm a legal alien" without any prompting from Sting. At one point, he turned to his band in a gesture that seemed to say, "Can you believe this?" People finally politely quit it when Sting started in. It was clear at this point that Sting didn't have to wind this audience. They loved him and were unabashedly channeling that energy straight at him. He excused himself to take a drink of water and they go ape crazy. He had them at the start, and the only thing he could possibly do was lose them. There was no danger of that as their playlist was making all the right stops. 'Demolition Man' made the list, an unexpected choice. There was a bit of show-and-tell as he pulled out a stuffed toy, an aid for his explanation of what 'End Of The Game' was all about. It was a quiet tender moment with 'Fields Of Gold'. The high point of the evening was 'Message In A Bottle'. Many a juvenile moment was this song screamed in private, volume cranked all the way up, in retrospect a silly moment of existential anguish - just a castaway, an island lost at sea-oh. Here it is again decades later, except that when the lights illuminate the audience and we can see each other, we scream for the very life of us, "seems I'm not alone in being alone." We knew things were building to a climax, the much maligned but anthemic 'Roxanne.' Given the energy that was bouncing off the walls, an encore was inevitable. 'King of Pain' had everybody's soul up there. But this was trumped by the near mad hysteria that greeted that stalker anthem 'Every Breath You Take'. It was chest-crushingly difficult to take it all in at this point. But they come back out for a second encore with the punk-powered 'Next To You'. An added treat was the appearance on stage of a man in a teddy bear suit dancing as hard and as erratically as the rest of us, roundish head bobbing back and forth. At this point you can't help but admire how hard Sting was working for everyone, as he comes out for an out of this world third encore. He dedicated 'Fragile' to all the victims and fatalities of Typhoon Pablo, which elicited an odd miscue from the audience as their cheer could have been mistaken for a celebration of the tragic calamity. Which of course, was not the intent of anyone. The denouement that followed was most welcome, as this just couldn't keep building up. Sting's and his mates' farewell waves and bows were like a long-range hug. And we all hugged him right back, in our sweaty, middle-aged exhaustion, glad for having dropped pretensions to hipdom.